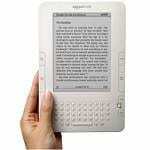 Amazon has yet again announced a reduction in the price of the Kindle wireless ebook reader. This is the Third price cut for Amazon Kindle ebook reader in its history. Amazon Kindle ebook reader is now priced at $189 from $259. Kindle 2 was first selling for $359, then $299, $259, and now $189. This latest price drop is most likely a response to increasing competition from other ebook readers like Nook from Barnes & Nobles and iPad from Apple. Amazon Kindle is a wireless e-book reader that allows you buy books at the Kindle store at a price cheaper than paper editions and have it delivered free to your device within 60 seconds using an innovative wireless technology called Whispernet over Sprint US high-speed 3G EVDO network. The new Kindle with global wireless capability delivers your purchases using Whispernet over the more globally available high-speed 3G HSDPA or GPRS/EDGE networks in over 100 countries depending on availability. Outside wireless coverage you can buy and download Kindle books using your computer and transfer them to your Kindle via USB. Amazon Kindle is also charged via USB using a USB power adapter. Kindle can hold up to 1500 e-books, a lot of books to carry in 282.2 grammes. At the Kindle store you have over 350,000 Kindle books to choose from including 104 out of 112 New York Times Bestsellers as well as top newspapers, magazines, and blogs. 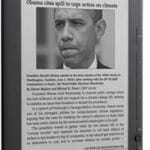 Most New York Times Bestsellers sell for $9.99, over 630,000 books are available at the Kindle store. You can save up to 60% on some Kindle titles.